Luckily, some fantastic shops agreed to have me work with them. I’ve loved getting to know cities like Leeds, Edinburgh, Derby and Manchester, and recently visited Heerlen in The Netherlands. I can’t express enough how valuable guest spots can be for artists, both in the early stages of your career and thereafter. They are a great way to learn off of other artists and have valuable conversations. In terms of travel goals for the future, I have a love affair with Southern California so I would love to guest there as well as the East Coast, Canada and Australia. Which is your favourite studio to visit, if you have one! I have been to so many now but I have to say one of the best is Semper Tattoo in Scotland. I worked there this this year and had the best time. David Corden and the other artists are all crazily talented and friendly, some of the most super humble people I’ve had the pleasure of tattooing alongside. Let’s talk Birmingham. You work with Dawnii and the team at Painted Lady – what’s life like there? I adore working with Dawnii and love being a resident artist at Painted Lady. I followed Dawnii and her shop online for years and really idolised both. To work there now in all honestly feels like a dream – I feel so so grateful to be part of the team, I work with some very talented people and again, learn so much from each of them. You’ve come such a long way in three years. Do you take time to stop and reflect on where you’ve been so far and what you plan to do in the future? In terms of achievements so far, a lot of this is down to mindset and being clear about what my goals were, and are. I have always been quite an ambitious person and if I really want something then I will work hard to achieve it. 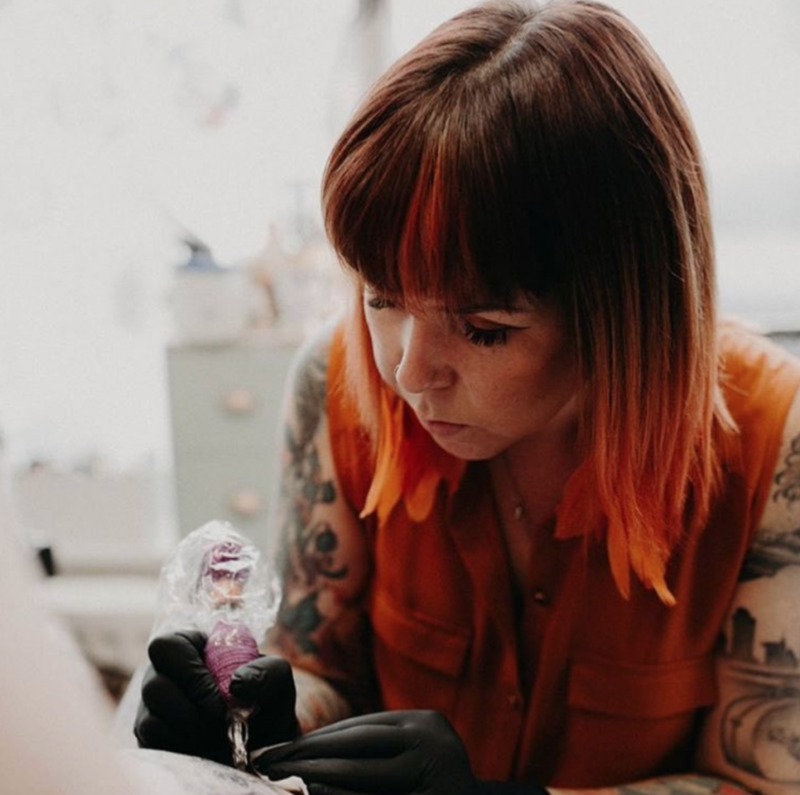 I didn’t start tattooing until I was 31 and so felt like I had a lot of catching up to do – not with anyone else but with my own personal goals. I think when I take a few minutes to reflect on the whirlwind that has been the last three years, I am proud of what I’ve achieved in a short space of time. I feel very grateful for all the opportunities I’ve been given. For me it’s imperative to have goals – without goals and dreams I would lack focus, direction and probably live a mediocre life. I want the best life for my family and it’s all possible so why not aim high? There’s a lot that I would still like to achieve and someday I believe I shall, but for now I just focus on making each tattoo better than the last and giving it my all. What do you see as your single biggest accomplishment? I think having the opportunity to work at such a reputable shop as Painted Lady – it was my proudest moment when they told me I had gotten the job. What pushes you the most out of your comfort zone? I tattoo a lot of character work and although it still requires skill I can only push myself so far with it. 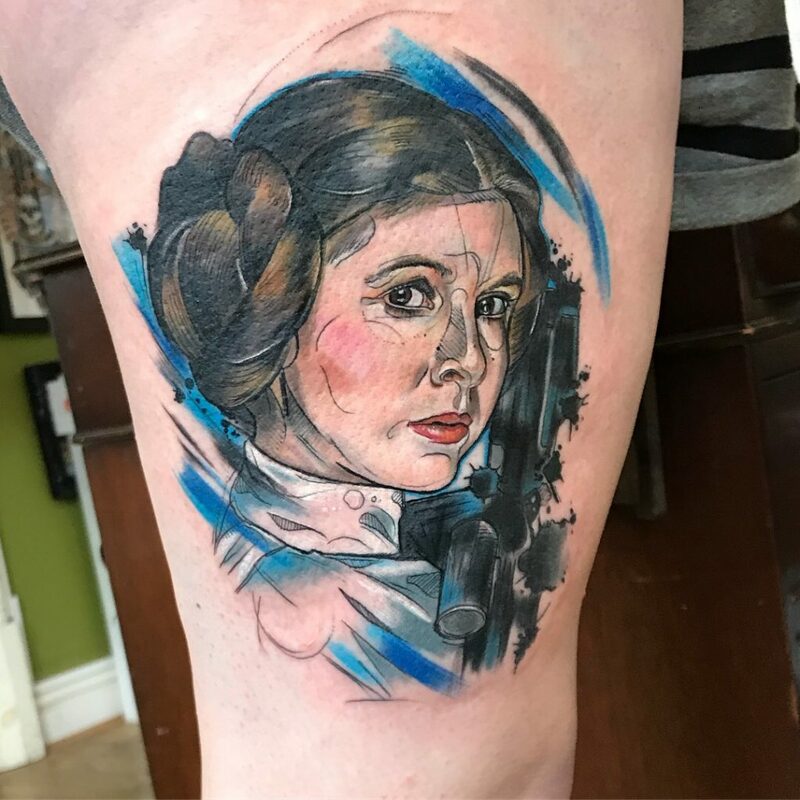 I love a challenge so recently I have started doing more portrait tattoos in my style – I used to really love painting and drawing them and was intrigued to see how they would turn out on skin. 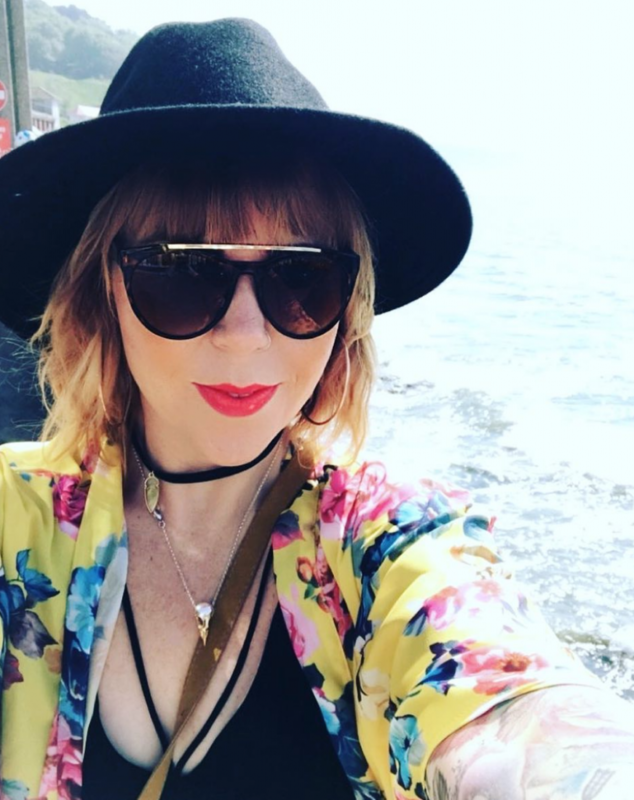 It took me a little while to be brave enough to try one but thankfully my fiancé James offered me a free thigh so I thought ‘why not?’ I was happy with how it turned out and most importantly, so was James, so that gave me confidence to try more. Now, portraits are one of my favourite things to do and I really hope I get to do more in future. Do you have a favourite tattoo of all time? Or a favourite recent one that you’d put at the top of your portfolio? I have a few favourites so it’s hard to pick. I am currently working on a large back-piece though which has taken multiple sessions and has been a huge learning experience. I think once that’s completed, it will be my ultimate favourite. 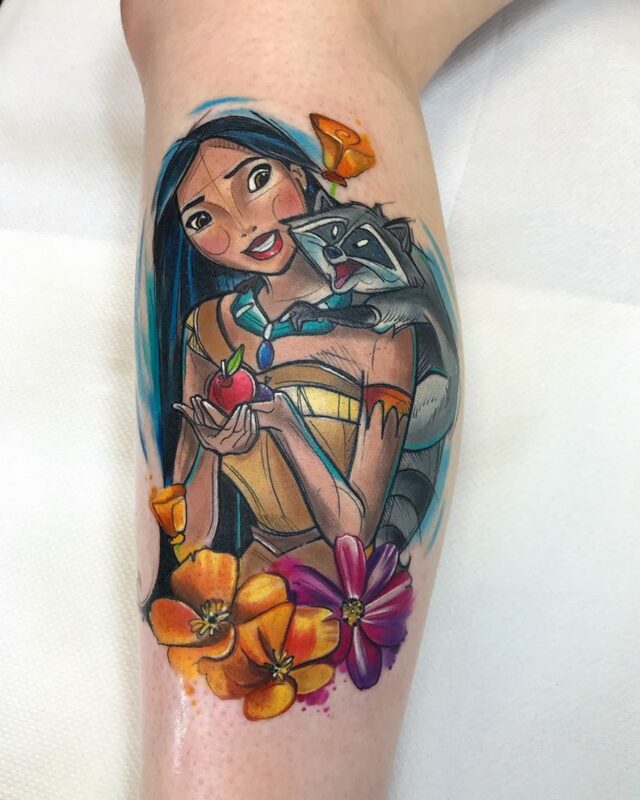 Do you think you’ll always focus on Disney-themed tattoos or are you keen to explore other avenues? I would say that 98% of my tattoo work is based on Disney characters. I grew up on Disney and will never get bored of it but there are certain elements in my character work that I want to develop and explore. 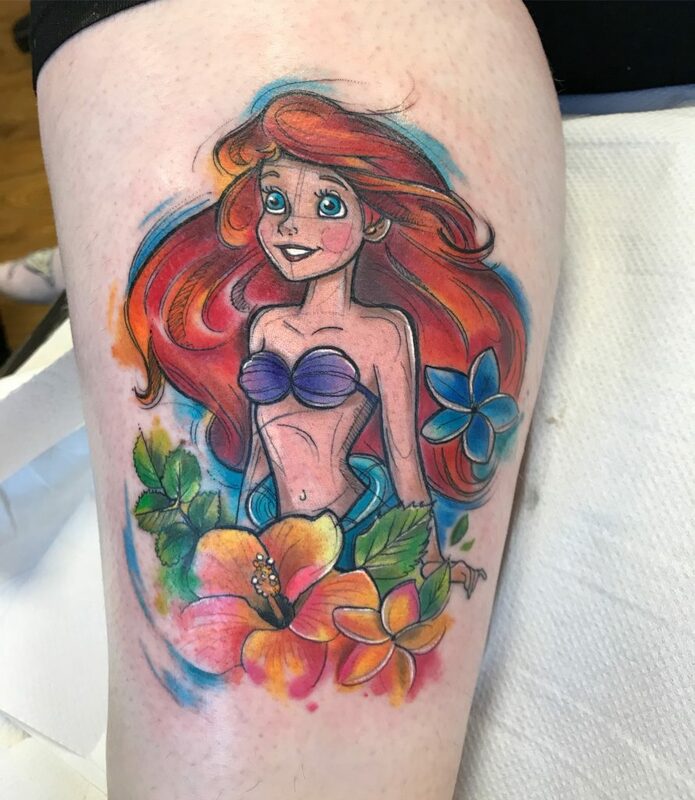 When you are using a pre-existing image of a character, there is only so much you can do with it to turn it into your own creation, but still there are so many of us Disney tattoo artists out there, all identifiable by the little quirks we have that make us unique. 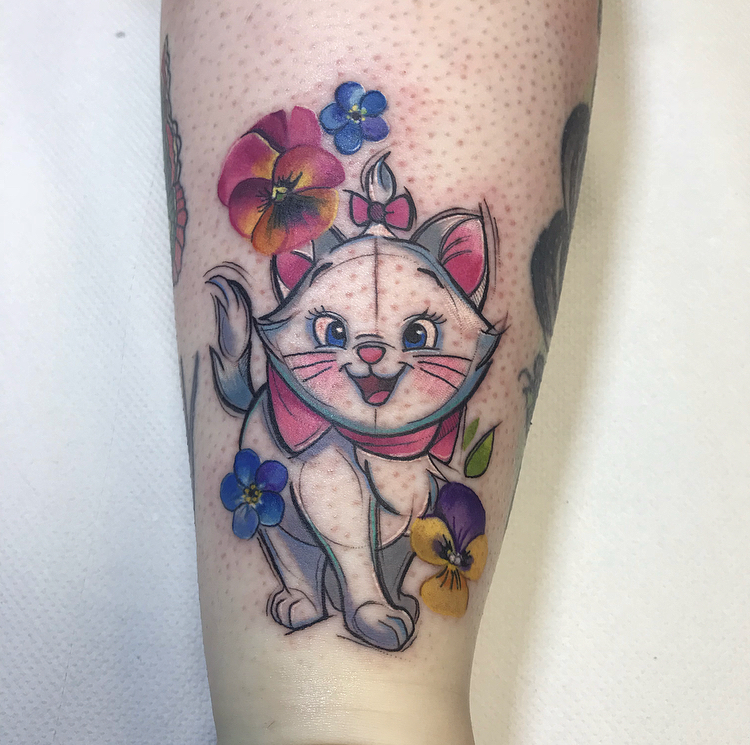 There will always be a long-running argument that tattooing Disney characters is an easy job but I want to show people otherwise. I hope what makes my creations different and likeable is the way I add other elements to them and have an attention to detail with every tattoo I do. I LOVE detail and in 2019 I want to focus on larger-scale pieces without so many elements in, so I can do less elements, really well. 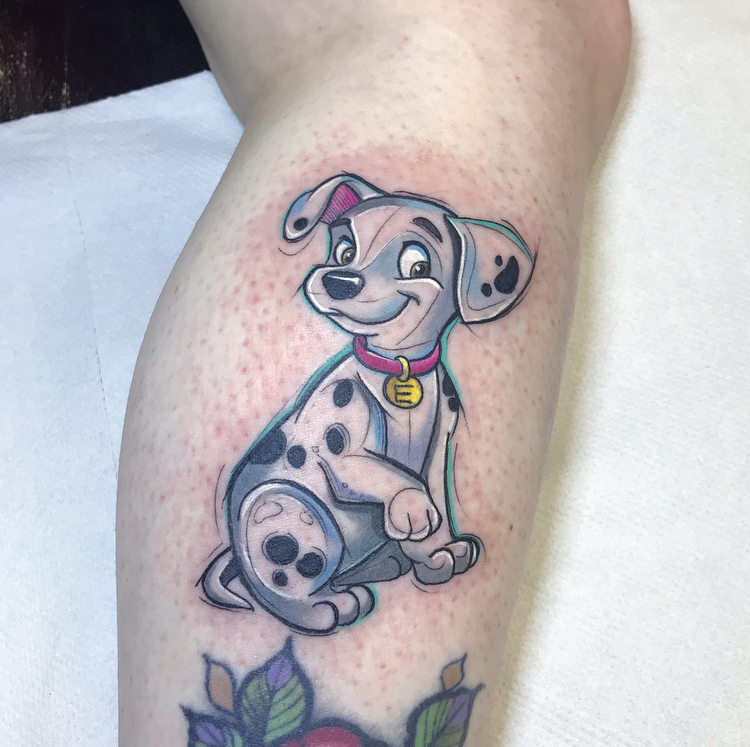 Regarding keeping Disney to its true form, sometimes I ask clients why they have picked me to do their tattoo and they say it’s because I keep the characters’ faces true to the movies and original Disney concepts. Because I have always used Disney film stills and books to reference my material, I have always tried to make the designs as honest to the original as possible. However, there are some amazing artists out there who create their own more stylised versions of characters – this is something I would love to dabble around with more in 2019. As much as I love tattooing characters, I also love flowers, animals and portraits, and enjoy working in more of a photo-realistic way. This imagery and approach offers me a different and exciting challenges (in comparison to my character work) because I have to think more and question myself and my decisions. I will definitely be doing more of this moving forward – I get a thrill from challenging myself with something new and then being pleased with how something has turned out. Russell Van Schaick – He was the first artist to introduce me to an illustrative, sketchy style and is someone that inspires my daily. Michelle Maddison – There is nothing this lady can’t do! I’m obsessed with all of her tattoos. I fell in love with her floral work first of all. She tattoos in a colour realism style and it just feels so rich and luxurious. 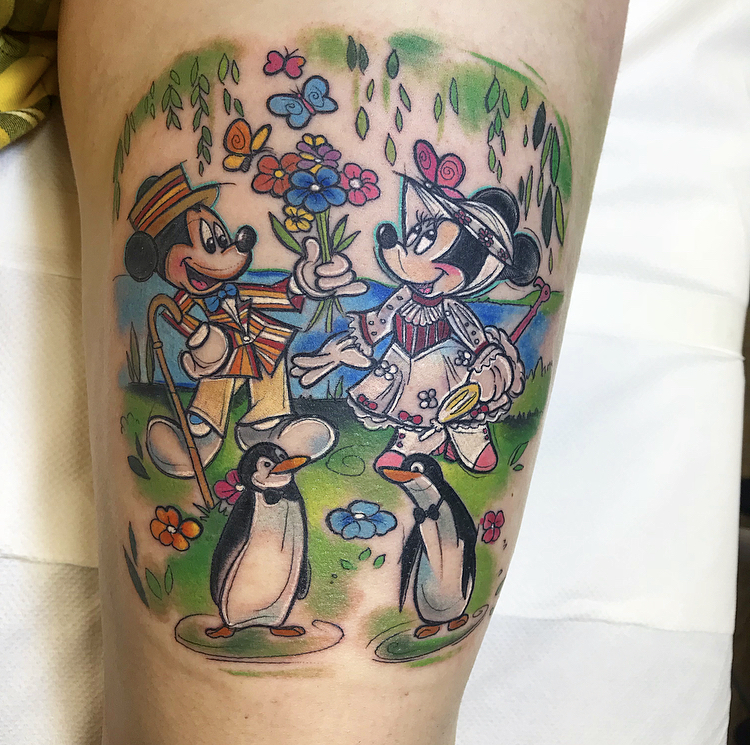 Miss Mae La Roux – She’s the queen of Disney tattoos – no more needs to be said! Marie Cox – I have known Marie since my apprenticeship and she’s always been a massive support to me. I’ve had the privilege of working with her too at her studio in Tamworth. I love her nature and botanical work and her amazing compositions. Jenna Kerr – I love how intricate and detailed Jenna’s work is. Everything is so clean, precise and super pretty. I know you’re quite interested in motivational speaking. What drew you to having a focus on self-improvement and self-care, why do you think it’s important in an industry like tattooing? I spent the entirety of my 20s feeling incredibly insecure – insecure in myself, insecure in life and insecure in my purpose. I had great jobs but never felt fulfilled. As I was reaching 30, a friend introduced me to a book called The Secret – after a few listens to the audiobook and further time researching The Law of Attraction, something began to click. Shortly after got my first tattoo it all fell into place – I knew what I wanted to do and knew how to get there. What I needed was to write an action plan, work hard and most importantly have the right mindset. I gave up my managerial job and went in pursuit of an apprenticeship. I was focused, positive and relentless, which is important because the tattoo industry can be crazy (in good ways and bad ways). If I hadn’t done so much work on self-development then I wouldn’t have been so. Overall, this is an incredible industry and we are all so lucky to be part of it, we should be grateful and humble that tattooing enables us to pay our bills whilst doing what we love. As the tattoo industry grows, having an awareness of your own self-development and improvement really aids your work. I don’t think you can be a true artist if you don’t care about doing the best you possibly can, wanting to be better each time. Like many artists, I live and breathe my craft and am always pushing to improve myself. Whilst I am entirely grateful and happy that I have been so busy this year, I have neglected my own welfare a little too. One of the biggest lessons I’ve learnt is that you cannot serve to be the best you can if you are not looking after yourself. In 2019 I have promised myself more time out because resenting my art is something I never, ever want to happen. Self care is essential. Well that’s tattooing… what about non-tattoo life? Where would we find you during your free time? Outside of tattooing, you’ll find me playing my cello (I’m part of a symphony orchestra) walking our little sausage dog Winnie, or jetting off to Southern California (when time and money permits). Any last words? In the words of Cinderella, ‘have courage and be kind’.